Jasmine and I have often talked about her sharing her story and she has decided that she wants to share her story. She has been working diligently on her blog and has now written quite a few posts. Flower That Blooms I love that she is sharing what her life was like. She is helping others see what being an orphan truly means. She hopes she will be able to help other orphans who may be afraid to come to America. She prays that more children will be adopted. While she writes hoping she is helping others, she is healing. I see a glimpse of belief in her eyes that her life has meaning. She understands that all things may not be good but all things can work together for good. She may not understand the whys. The truth is none of us will on this side but she sees a purpose and wants to live her life for that purpose. 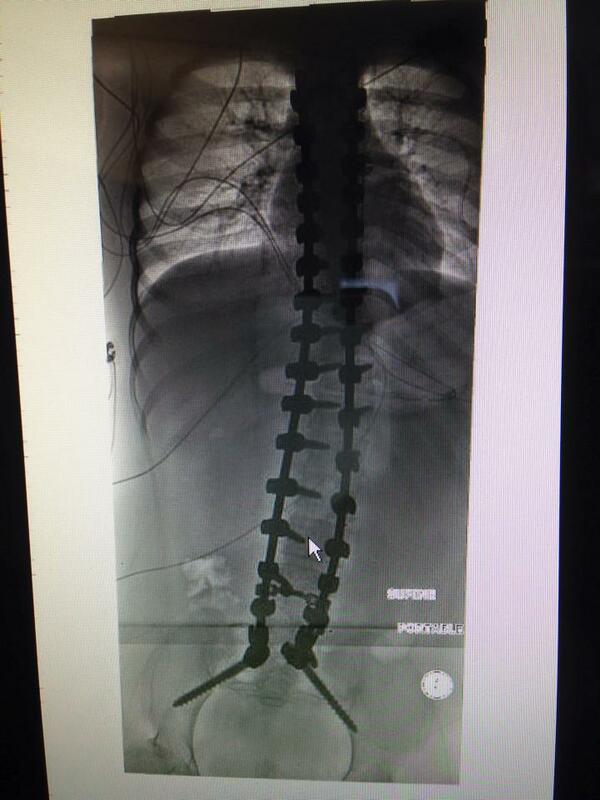 Last Tuesday Jasmine had a spinal fusion done on her back. 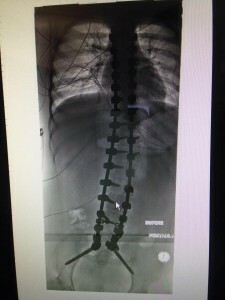 This procedure will make it so she can sit up straight because the truth is as Jasmine’s muscles deteriorate, her spine can no longer be held up, which in turn affects her breathing and eating. Here are here before and after x-rays. During the surgery they took a couple muscle biopsies so we can get an accurate diagnosis for her. We know she has a neuromuscular disorder, presumably muscular dystrophy, but this will give us a correct diagnosis or at least that is the plan. Jasmine’s life has not been easy. She says she can remember being clumsy at about the age of two, she was unable to walk very well by the time she was four, which made her father very angry, this was when she went to live with her grandmother. When she was almost eight years old, her grandmother, after deciding Jasmine was too heavy to move, took Jasmine to the orphanage and dropped her off, vowing to one day return. Her grandmother visited a couple times and then stopped showing up. Jasmine has been through more than any of us should ever have to go through and all of this with a body that slowly fails her. This is what I want to talk about today, what a day in the life of Jasmine is like. I realized after messaging a few people during our stay here in the hospital, that not many really understand what Jasmine has or what a day in her life looks like. For Jasmine every single thing is an effort. She is unable to sit up on her own. When she wakes up in the morning, she must lie there until someone comes to sit her up. Her body has been in one position for a long time and she is often in pain. It takes two of us to move her. We have to help her to the toilet. She needs us to move her to the shower. I have to wash her hair because she can not lift her arms high enough to reach her hair. Put your elbows into your side, hold them tight there, add ten pound weights to your forearms, and then try to move your hands around. That is as much movement as she has. Something as simple as itching your ear requires her holding her arm up by the elbow with her other hand. To move her legs, she tries hard to lift them by pulling on her pant leg. She is unable to move them very far. It can take her ten minutes to move her foot a mere inch. It frustrates her so. She is unable to dress herself. She can not do something as simple as putting on a sock. I sometimes forget as I’m placing her arms in her sleeves and let go. Her arms falls heavily to her side. We place her in her wheelchair where she insists on buckling her buckle herself. She can not reach down to pick up the buckles. You have to place them in her lap and then she takes minutes to try and put them together. Just lining up the two sides takes great effort and pushing them together takes great force that she just doesn’t have. Then its time to brush her teeth. She leans forward and picks up her toothbrush. She has to lean forward, place one elbow on the armrest of her wheelchair, and hold up her other arm to get it high enough to brush her teeth. 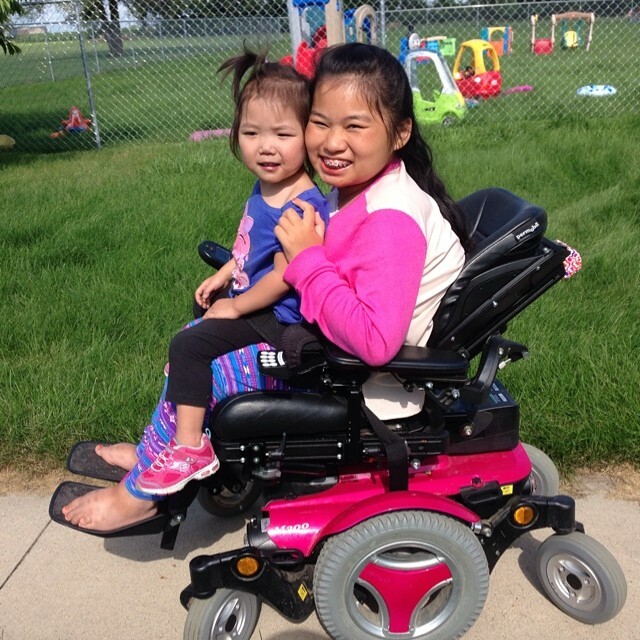 She loves her power wheelchair and the freedom it gives her to move where she wants. She heads out of her bathroom and comes to the bedroom door. If this door is shut, she can not open it. Even if she could turn the knob, she does not have enough strength to pull the door towards her as she slowly moves her chair backwards. We have tried the pull down handles and even those take too much effort. She can easily be trapped inside her own room. If she does get stuck and tries to call for help, finding enough air in her lungs to make the sound necessary to be heard across the house is impossible. She wants to get her school books herself. It will take her a good 15-30 minutes to pull the books out of the cubby, drop them one and a time onto the foot pedals on her wheelchair, all while she is leaning as far forward as she can, and then comes the hard part – getting the books on the table. She does it all in reverse. She slowly takes one book at a time from her foot pedals and struggles to get it on the table. It would be so easy for me to walk over and get her books. It would take mere seconds to throw them on the table. Every day I watch her struggle. I watch her refuse to give up her independence. She wants to do it for herself and I have to let her do what she can while she can. Oh the things we take for granted. Bending over and picking up a pencil off the floor is so easy for us. For Jasmine it means taking her chair to go get her claw that she uses to pick up stuff off the floor, she leans forward and slowly lines it up. It takes both hands to squeeze the handle and pick up her pencil. She then sits the pencil on her foot pedal of her wheelchair. She leans as far forward as she can and picks it up, and then has to slowly pull herself back up. She can still get herself up if she has something to push against with her arms. If she falls backwards in her chair, she can not get back up. She just doesn’t have the strength to pull herself up. She wants so badly to have chores and do what the other children are doing. It is hard to assign chores to someone that does not even have the strength to pull a plate out of a dishwasher. We have had to get creative with our chore list. Her main chore consists of picking the things up off the floor in the living room. She takes her claw and picks up the items she can reach on the floor. This is a never ending job with toddlers but she never complains. The other chore Jasmine helps with is feeding Lainey. Lainey is unable to feed herself. She eats every three hours starting at 6 a.m. Jasmine gets as close as she can to the high chair, leans forward, and puts her elbows on the tray. Lainey has learned to lean forward and eat off the spoon. Jasmine loves little kids and is so good with Lainey. It’s very sweet to watch her care for Lainey. It must have been so hard for her to sit at the orphanage and not be able to care for the other children. Although, we do know she liked to read to the other children. She really is a great big sister and has such a compassionate heart. Her fun for the day is going out into the backyard and going around the 900 foot cement path we put in. She drives around and around at the highest speed she can safely go. I asked her why she likes to just go in circles and she told me that for years she had to sit in the corner at the orphanage. She couldn’t move herself. She just sat there. She wasn’t allowed to go to school. She was told she was worthless and lazy. The freedom of going anywhere, even if it is just a circle of cement in our backyard, is a blessing. One of her favorite things to do is have us buckle in Evie with her on the chair. She loves to give Evie rides on her chair. Jasmine spends all day in her wheelchair. She is no longer able to be moved to the couch because she falls over. There isn’t enough support in the cushions. At the end of the day, we do it in reverse. She brushes her teeth, we place her on the toilet, and we carry her to bed. She slowly lowers herself to the bed. I can not even watch this. It scares me so. She more or less lets herself drop to the side and slowly and painfully tries to squirm her way into a position where she can breath on her side. I ask her over and over again to just let me help her but she wants to continue to do what she can. Can you imagine what that feels like as a person? You don’t have a choice without help you can’t go to the bathroom, you can’t get into bed, you can not get out of your wheelchair. If she tried to move out of her chair, she would fall on her face. She can sit unassisted if you get her positioned just perfectly. It’s like a baby who is just learning to sit. If you adjust them just right, they can hold themselves up, but one little bump knocks them over. But unlike a baby, Jasmine can not roll over and move herself. I think about her alone in China. She was at their mercy and she has shared some horrible stories. 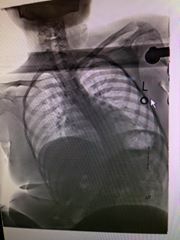 Stories of being taken to the doctor who told them that she should be able to walk so they left her food just out of reach. They informed her that when she was hungry enough she would quit being lazy and get up and walk to her food. She went all day without food and finally tried to move forward. She fell out of her chair and they told her to get up. She says she slept on the floor. This went on for quite a while. She has told us that when she would have an accident, because there was no one to take her to the bathroom, they would allow the little and big children to hit and kick her as punishment. Whenever you think that it’s okay for these children to be in an orphanage, please think about what Jasmine has shared. Whenever you think that you just can’t adopt a special needs child because it would complicate your life too much, think about what your not adopting them means for their little lives. We have been told that Jasmine would have gone to an institution where it was survival of the fittest. I asked specifically about this because I didn’t want to not be telling the truth. Jasmine was two weeks away from this truth. The nannies told her what her future held. They let her know that she would be hit, there would be no one to feed her and that she would probably be left in a corner. And yet Jasmine is joyful. I spend my days caring for others. I spend pretty much every waking moment doing something for someone else. I can do this without feeling sorry for myself. I can do this and still feel joyful every day because I have learned to take my eyes off myself. If I start thinking I could be getting a pedicure right now….I think about where Jasmine would be. If I start thinking a vacation would be nice, I picture how sad Lainey was and where she is now. If I dream about having a house that stays clean, I remember where Ben, Eli and Evie, who were considered inoperable and terminal in China, would be now. Jasmine’s life has brought me greater perspective. Jasmine’s biggest fear heading into this surgery wasn’t the surgery itself. Jasmine’s biggest fear was that she would wake up and we wouldn’t be there. Jasmine’s biggest fear was that we would decide we no longer want her. Why does she have these fears? Because it has happened to her before. She has been through hospital stays by herself. She has been abandoned and left alone. She has been told that she is unworthy of love and a family. I often wonder how such a sweet soul survived in an orphanage for so long. How did she go through years of hearing how worthless she was and keep her joy? How did she endure more than any child should have to and still keep her beautiful smile? I am sharing these truths about Jasmine because I want you to understand just what she goes through every day and what it truly means for her to choose joy. Every day she chooses to be joyful. Every day she refuses to give up. Every day she does all that she can to the best of her abilities. Every single day without fail. 1.) Don’t be afraid to do the hard things, sometimes they are the biggest blessings. 2.) You can choose to be joyful. 3.) Adoption isn’t about you. 4.) God has a plan for you no matter how much or how little you can do. Jasmine endured her hospital stay with great grace. She was polite and kind to others. Her life is a beautiful testimony! Please continue to keep her in your prayers as she has six weeks of lying back at a 60 degree angle in her wheelchair and six months of not being able to be moved with any ease.